More and more I am getting facebook appeals for me to sign a petition to support this good cause or to stop these other guys from doing what they are doing. If there was a ring involved, it would be like all of the phone calls I get to support all of these weird charities. A number of years ago, my wife (and I) supported numerous charities, one of them being Wheelchair athletes. One day someone told my wife that although they played basketball in wheelchairs, most of the participants were not bound to wheelchairs. We just thought this to be another one of those urban myths until the next time that we were called to donate. My wife asked if all of the athletes were physically handicapped and the guy said that they all weren’t but most of the money went to support the sport. It turns out that our charitable money went to fund healthy people playing wheelchair sports. That was the last time we gave to them, I have always felt that if you want to play sports, then you can pay your own way. When I was working, it seemed that there was always someone selling chocolate almonds, popcorn or tickets on a draw to help fund their kid’s activity. I always bought because I sold items for my kid’s teams and activities and turnabout is fair play. One day a guy came up selling tickets on a draw and I asked if it were for his son’s team. He told me it was for his own baseball team and they were going to Las Vegas to play in a tournament. I told him that if he wanted to go to Vegas, that was fine but I wouldn’t be paying his way. So far this morning I had a facebook plea to sign a petition to save the CBC radio from the Conservative government’s bill that would cut its funding. The CBC is publicly funded and is able to do things that doesn’t generate a profit but makes for a better Canada. They show both sides of whatever issue is in the news and will play the music of Canadian musicians that might not be as popular as Justin Beiber. Private radio stations have an editorial bias from the owners that comes through either intentionally or secretly. This particular government has attempted to muzzle the CBC in the past with funding cuts and veiled threats. I signed the online petition, but it has been my experience that governments will do what they want and tell you that it is your best interest. There was another plea just a minute or so ago for me to sign a petition to stop Nestles from draining the aquifer in an Ontario town of Hillsborough. It seems that the company has managed to get government approval to take upwards of a million litres of water a day for their bottling operation. The town has to limit the water usage in summer months and they don’t feel it is right that Nestles can continue to draw water unabated. I guess this is where the petition comes in. I’m not a big fan of large conglomerates, so I will more than likely sign the petition, with some hesitation. I don’t like big business, but they make the world turn and pay the salaries that make it possible for our society to have the standard of living that we have. The trouble with petitions, all petitions, is that they only reflect the opinion of one side and the other side doesn’t get to state their side of the argument. The internet is also notorious for incorrect statistics and sometimes just outright lies. You don’t know the facts unless you take the time to research and most of us don’t bother to. It is especially true when I am already prone to find the big corporations and government guilty of pretty much any kind of crooked, thieving behaviour. 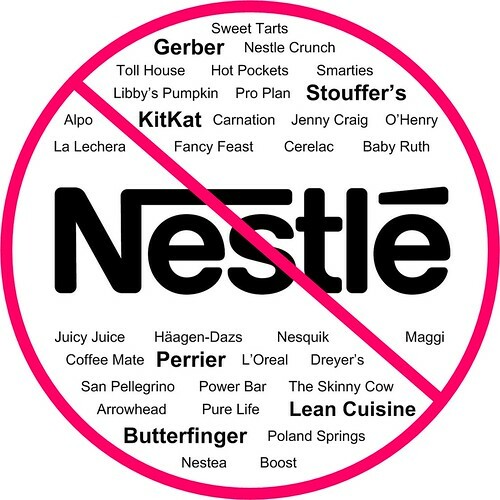 I am just going to sign the petition even though I like Nestles chocolate drink mix and many of their chocolate bars. It is possible that Nestles is just the North American branch of the WONKA Chocolate factory and everything will just be fine because "…tremendous things are in store for you."